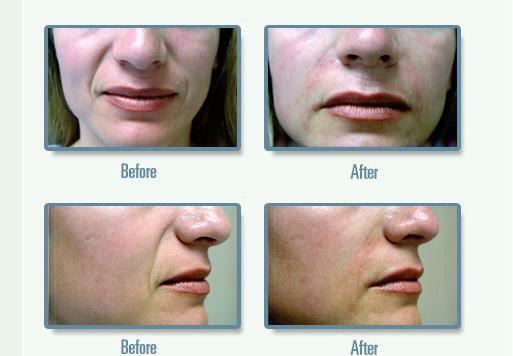 You like Restalyne, Botox or Juvederm?You're going to love Bellafill -- it's permanent! Dr. Hamilton offers a full range of services designed to smooth away wrinkles and enhance the lips, including Restylane®, Bellafill®, and Radiesse™ injections, in his offices in Beverly Hills and the Woodland Hills area of Los Angeles. Lip enhancement and wrinkle removal are his Woodland Hills, Beverly Hills, and Los Angeles patients’ most popular requests. For many years, Dr. Hamilton has enlarged patients’ lips to a more pleasing and youthful fullness. Both permanent and temporary enlargement are offered through various injectable substances introduced comfortably under topical or local anesthesia. He also offers a variety of fillers that can erase the effects of aging by filling marionette lines, smile lines, forehead lines, crow’s feet, and other skin depressions. Read on to find out more about the lip enhancement and wrinkle removal options in our Los Angeles / Beverly Hills & Woodland Hills offices. Radiesse™ is now available in our Beverly Hills & Woodland Hills offices and composed of calcium hydroxylapatite, a naturally occurring component found in bone and teeth that appears to have no risk of allergy when used as an implant. Radiesse™ is synthesized in 25-45 micron diameter sized microspheres and injections in augmentation of the larynx and as a soft tissue (e.g., skin) market for surgical placing. Radiesse™ is FDA approved for both of these uses and has been used in Europe for the past few years as a tissue augmentation substance for the treatment of depressed defects on the face, e.g. expression lines, scars, acne and lip enlargement. We have been treating patients with Radiesse™ since December 2002 in our Beverly Hills & Woodland Hills offices for the above purposes and to also help introduce this procedure in the United States. The procedure is performed with a small gauge needle injection after the application of a topical anesthetic cream. You'll begin to notice results on the day of the procedure, and effects typically last 1 to 2 years. As of April 2006 we had treated over 400 patients with Radiesse™. Dr Hamilton is a member of The Medical Education Faculty of Bioform Corp and trains other physicians in this procedure. He also performs clinical trials for the company. This injection dramatically eliminates deep frown and forehead lines and crow’s feet lines. Results last several months. BOTOX® Cosmetic, a natural, purified protein that relaxes muscles, is also used to treat an aging neck. There’s no recovery time, so you can get back to work or participate in other activities immediately! Read more about our BOTOX® treatments. We offer several new temporary filler substances that we are using to enlarge the lips, remove smile lines, forehead lines, and other skin imperfections. Contact our practice today to learn more about Perlane, and Hyaluronic Acid. You may contact our office today to learn more. Dr. Hamilton has used Bellafill® in his office in Beverly Hills & Woodland Hills offices to treat deep wrinkles, depressions under the eyes, depressed acne scars, and chicken pox scars. Composed of PMMA (Polymethylmethacrylate), lidocaine, and bovine collagen, Bellafill® can permanently eliminate unsightly lines and wrinkles, leaving the skin looking younger, radiant, and revitalized. Effects look extremely natural. You may be treated with Bellafill® in our offices in the Woodland Hills area of Los Angeles and in Beverly Hills. The area to be treated is injected with Bellafill® after application of a topical anesthetic. Unlike prior approaches, such as Restylane/Perlane injections, the area is not overcorrected (not raised up much above flat skin level). There is immediate improvement as the area treated is raised to about normal skin level. Generally, there is virtually no discomfort at all at the time of the Bellafill® treatment. Rarely, there is some mild stinging for a day or two afterward. Are There Side Effects to Bellafill? PMMA has been used in medicine and dentistry for over 30 years and has been left in the body in thousands of patients as bone cement and other forms for many years with no allergies or any harmful effects. The other two parts of the solution have been used for decades with no proof of any health risk. Rarely, as with any filler substance, irregularities have been reported which are normally readily treatable. Because of it's permanence the most important factor in your results is who is your injector. THis is not a procedure for an unregulated "spa". It requires training and the more experience the better (See Dr. Hamilton's background as the U.S pioneer). Is Allergy Testing Required for Bellafill? Yes. You will be tested for allergy by a forearm injection and we will wait one month to confirm that you are not allergic to Bellafill®. How Many Times Must I Be Treated? Research in other countries, such as those in Europe, shows that approximately two-thirds of patients needed only one Bellafill®. We have had only one patient allergic to Bellafill; studies showa considerably higher rate of side effects from other fillers (though low) than with Bellafill. What Is The Interval Between Bellafill® Treatments? The area injected with Bellafill® is raised by the bovine collagen, which then disappears over 1-3 months. As this collagen (temporary) is disappearing, more or less simultaneously the patient’s (permanent) collagen is being produced to replace it. Studies have shown the amount of the patient’s collagen replaces most of the injected collagen, so most of the initial resolution of the defect (wrinkle, etc.) is permanent. One theory is that the patient's collagen has been stimulated by PMMA. This theory is awaiting further research support. No movement has been shown to occur. It would not be expected to occur since there really is not anything to shift: PMMA micro droplets (microspheres of 30-40 microns) are surrounded by the patient’s own collagen. How Long Has This Procedure Been Done? The procedure has been performed in Europe since 1992. In the U.S., Douglas Hamilton, MD, performed the procedure on the first patient treated with Bellafill®(Artefill®) in the United States in early 1998. He was one of the 10 investigators chosen around the U.S. (and the only one in the Los Angeles area) to do studies for the manufacturer to apply for FDA approval. He presented the first two major addresses at an American meeting of physicians when he was invited to speak at the annual convention of the American Academy of Dermatology (AAD) in 1999 and in 2000. This AAD meeting is the largest annual meeting of dermatologists in the world. Additionally, he published the first medical journal report in the U.S. on patients treated with Artefill® (2000) and has since published (or in publication) three additional articles in medical journals on the study and use of Artefill®. He was the only M.. invited to the FDA approval meeting; was interviewed by National ABC news immediately after it was approved. If you would like to learn more about Bellafill® and are in the Woodland Hills area of Los Angeles or Beverly Hills, please contact Dr. Hamilton today. Juvéderm is a smooth consistency gel made of hyaluronic acid-a naturally occurring substance in your skin that helps to add volume and hydration for lip augmentation and facial expression lines. Studies show superior results of Juvéderm compared to a collagen-based dermal filler. In addition, Juvéderm injectable gel is the first FDA-approved hyaluronic acid dermal filler that is proven to be safe and effective for persons of color. Dr. Hamilton also chaired the opinion paper for the ASDS on Juvéderm™ (co-authors Gary Monheit, M.D. and Kimberly Butterwick, M.D. ).